Last year when I watched The Dunwich Horror, I stated my opinion that most of H.P. Lovecraft's work has never been put on film in a really good way. My friend Scott, who guest blogged a few entries with me this month, told me about Guillermo del Toro's production of At the Mountains of Madness, which was in the works at Universal, a prospect which had me very excited. Unfortunately, the studio's vision differed from del Toro's, and it's been put on hold indefinitely. Fortunately, I can still change my opinion about Lovecraft adaptations now, because The Call of Cthulhu was just an immensely fun movie to watch. I included this as part of my Campy & B-Movies block because its production style (more about that in a minute) is very definitely low-fi, landing it in B-Movie territory, but it's not campy at all. Aside from a few small differences, this is a very faithful adaptation of Lovecraft's story. It's told in flashback, as a man tells about his obsessive study of a horrible cult, an obsession which was inspired by his great uncle's records of his own lifelong study of the same. Within this frame story, there are three separate stories, each one revealing more about the nature of the cult, the horrid secrets it conceals, and the fearsome deity that it worships. What made this movie fun to watch was the fashion in which it was made. Although it was shot only a few years ago, it's a black-and-white silent movie, the same in style as movies from the 1920s. Dialogue is given through the use of title cards, significant details are irised in upon, and the effects are decidedly old school. It's an approach that could become gimmicky if you saw it too often, but it works really well as an homage to the age of really great movie monsters. Did you see Brick, with Joseph Gordon-Levitt? It was really fun seeing a high school movie interpreted as a classic film noir, but that doesn't necessarily mean you want to see more movies made from that same template. The same applies here. It works because of its uniqueness. My one very small complaint is also a result of the way the movie was made. The movie was obviously made with a very low budget, something which actually doesn't work against it, because of the style the filmmakers were emulating. However, this also means that they couldn't afford to shoot on film, so the movie was made on digital video, and filters were applied to it to give the movie an aged, scratched, old film look. About halfway in, you stop noticing it, but for a while it's very noticeable. The picture has that very clear digital appearance to it, not a textured look like film would actually give. Like I said, though, that's a very small complaint. If you are a fan of vintage horror, H.P. 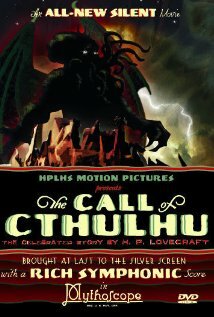 Lovecraft's writing, or independent film, I think you'll enjoy this. It's available on Netflix instant streaming, and it's only about 45 minutes long, so even if you don't like it, at least you haven't sunk too much time into it. I give it four Lil' Cthulhus out of five. What's cool is that until this morning, I had no idea who Deadmau5 is, but your comment is like the third place I've seen something about him just today. I'll have to check him out. Lovecraft wrote about all of these ancient, awful gods who were just waiting to be reawakened or break back into our dimension. Cthulhu is the biggest and baddest. He's got an octopus head, and he slumbers in the dead undersea city of R'lyeh. Stranger aeons, death may die." Rock on literate metal heads! Also, Deadmau5 is awesome. Start with For Lack of a Better Name, especially Ghosts and Stuff. You've just given me a really great idea for a show that follows a hapless, Spinal Tap-style metal band as they work to release their epic double album based on the works of Thomas Pynchon. "The Thing That Should Not Be" is a great tune. It gets bonus points for also mentioning the Crawling Chaos, Nyarlathotep (or maybe it's just referencing the story with that title?). Nyarlathotep is noteworthy because, unlike most of the deities in the Cthulhu mythos, he is neither imprisoned (like Cthulhu) nor exiled to the stars. A few of my faves are Strobe, Sofi Needs a Ladder, Some Chords and Raise Your Weapon, which has a little dubstep mixed in that I'm still a little on the fence about. Ghosts and Stuff is originally what got me interested in Deadmau5. It's good workout music! Do the Time Warp with Look What Danny Made!